One of the species we have on our farm is alpacas, which we raise for their gorgeous, ultra-warm and anti-allergenic fibre. Watch this short video as we shear one of the girls, who doesn't seem to mind it one bit. Another reason we keep alpacas is to complement our holistic approach to farm management. Alpacas are camelids, and calm graceful animals with very gentle temperaments. Alpacas are also social herd animals, and they have silky, luxuriant fibre. Their fibre is like wool, only it is better in several ways --- it is very soft, anti-allergenic, and extremely warm. People who are sensitive to wool find alpaca fibre as the ideal alternative. It is spun and made into garments, bedding, and any product where you might use wool. 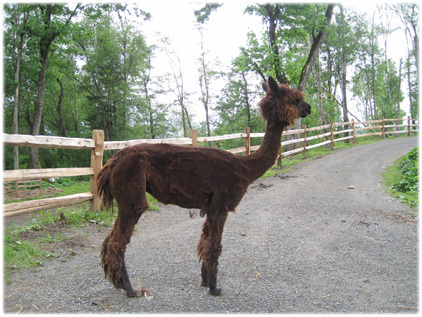 The alpacas are sheared once-a-year, which helps them be cool during the summer. This gorgeous alpaca has just received her spring haircut. If you enjoy spinning or want to try making products using their wonderful fibre, order some of our raw alpaca fibre from our product order page.